Archive by Category "Small Business Profiles"
The Small Business Social Media Profiles is a series where BlogWorld talks with small businesses about how they’ve incorporated social media into their website, marketing, and promotion. We ask for their input and hopefully encourage you to further your social media reach! 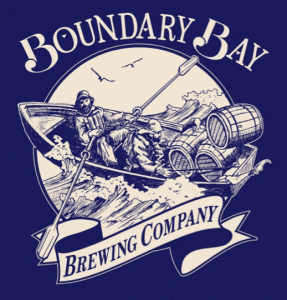 This week I talked with Amy Jones, PR/Social Media for Boundary Bay Brewery in Bellingham, WA. They are very prominent in social media with over 4k followers on their Twitter account and over 13k fans on Facebook. They also blog about local events, beer, and more on their Blog. When did you start integrating Twitter and Facebook into your business marketing and outreach? In October of 2008, we joined Twitter because we had beers being judged at the GABF and we had heard that on this website people would be posting live results of the awards. We, honestly, at the time, didn’t even know what Twitter was or what it meant to follow someone. But, we jumped on board and there was already a community of craft beer lovers quite active on Twitter who were there to welcome us. We joined Facebook not long after. How did you begin promoting your account and encourage fans to follow you? We found that on both Facebook and Twitter the craft beer community was already there to receive us. We’re such a small little brewery way up here in Bellingham, WA and social media was a way for our fans to connect with us in a manner they hadn’t been able to previously…unless they were here in person in Bellingham. We are also one of those businesses that is viewed as iconically Bellingham so people who had visited or once lived here or gone to college here wanted to connect with Boundary as a way of still being connected to this unique town. So, we had lots of eager fans ready and waiting. From there, we used in-house marketing to let our customers know that they could connect with us online too, but haven’t done much marketing beyond that except to “like” on Facebook other local businesses as well as our accounts that have our beer on tap. The community has really grown organically – rather than through our design. And I think our community continues to grow because we focus on providing all kinds of information to our social media community: Bellingham news and events, information from our accounts and/or other local businesses, home brewing news, craft beer connections and news from our own brewery about events, what’s on tap, the daily specials, etc. Do you run any contests, or specials, or have other interesting activities in place for social media? We’ve dabbled in a few contests and fun events through Social Media, but we’ve always pursued them in a spirit of fun and adventure…rather than to drive numbers or sales. We’ve asked our fans to write Haikus about particular beers of ours, to recommend their favorite BBAY beer and menu pairings and even to participate in a contest around Father’s Day where people wrote about which BBAY beer their Dad was the most like in hopes of winning a membership to WABL (WA Assoc. of Beer Lovers). We’ve invited some of our Twitter fans to join us in our beer garden for a tasting menu of our new summer desserts and to help us pair each dessert with a beer…but only if they’d post tweets about it while attending the event! We’ve even attempted a Virtual Brewers Night. We sent our beer and BBAY merchandise as prizes down to one of our accounts in Everett who has our beer on tap and invited our fans to show up with their smart phones in hand. They tweeted through the night with a pre-planned hashtag, answered trivia questions via Twitter to win beers and prizes at the bar and interacted with each other both in-person and virtually. Do you have a social media plan and/or policy in place? From the very beginning, we’ve viewed Social Media as a means of connecting with people and building both community and relationships. We see it as a place to listen and respond to the questions, suggestions and complaints of our customers. A place to engage them, draw them out, ask them questions and get them talking. Our only plan is to truly connect with our customers, our local community and with the craft beer community as a whole…not just push our own message. Our policy is to be as real, as open, as honest and as consistent as possible. We want our online voice and personality to match the feeling of our brewpub. We want to be authentic…always. Do you have a dedicated employee for social media or do you all interact? I am the only social media person here at Boundary Bay Brewery. Occasionally, my coworkers and/or my Manager fill in for me, but it’s mostly just me. Which really helps in providing a consistent, authentic voice. I have the freedom to take our Social Media wherever I believe it should grow and that openness is apparent in my interactions with our fans. I don’t have to wait for approval from my boss before I post something or check in with the owner before I answer a fan’s question. I can be real and be myself and that comes across. How important do you think social media is for a company, especially restaurants? I really think that social media is vital for every business…especially restaurants. It is a place where your fans can feel like they have a personal connection with your business, a place where you answer questions, a place to assert a real, tangible personality for your business and make clear your principles, goals, etc. It is a place to make, sustain and build community/relationships. How do you deal with questions/concerns/complaints via social media? Do you ever fear being too accessible? It has been our policy from the beginning to deal with questions/concerns/complaints in the public forum. Deleting negative posts or comments from our page has just always felt dishonest to me. We try to address whatever concerns have been raised publicly so that our whole fan base can see that interaction, gain that knowledge, and know that we care about what they’re saying and how we can make it right. Occasionally, we have asked someone who is complaining to email or call us with more information so we can follow up with our staff. But we only do that if it is something like describing which waitress they are complaining about, as those specific details don’t necessarily need to be online. But even if we’ve asked them to email us, we still leave their complaint up as well as our response addressing it. We believe it builds trust and authenticity and accountability. I don’t think we’ve ever really feared being too accessible. Putting it all out there via social media only means that we have to be truly, honestly accountable for our actions…even our mistakes. And of course that can be scary, but I believe it’s the right thing to do. If you’d like to have your small business profiled, please shoot me an email with your name and website! Small Business Social Media Profile: Meet Your Match Online! This week we are talking with Meet Your Match Online. You can follow them on their Twitter, YouTube, and Facebook accounts. They also have a blog you should check out! Founder, Laura Cunningham, used her background in psychology, and what she learned from experience, to create a targeted search system for her clients. It is this specialized process that sets her business apart. The dating ocean is large; her little black book is the entirety of the internet online dating world. But she tells her clients they don’t have to be the best at fishing to catch the right one – they just have to be very good at throwing the wrong ones back without wasting too much time on them! 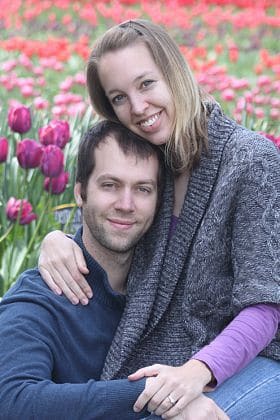 Because of her success with online dating, her background in psychology, and her legal training in counseling, her clients and co-workers often wanted to discuss online dating and how they could find “The One” for them. With the decreasing demand for business and real estate work in this economy, and the increasing demand for help finding love online, her matchmaking and date coaching business, Meet Your Match Online!, dedicated to helping others achieve her same success, was born. They offer a wide variety of services from a $45 First Impression Profile Review (creating the right first impression is critical) to a $725 platinum package for daters who need the works (a new profile, new photos, several hours of consultations, matchmaking, weekly updates and targeted search reports of the searches they run for them, etc.). After getting my business set up through the legal channels, my very first stop was getting my online dating website in place and a marketing plan going that was heavily focused in social media. I turned to an online and social media marketing company – The River Rock Group – for all my needs. They helped me to develop a marketing plan which incorporated online elements as well as getting out from behind the computer and into the real world as much as possible (e.g. speaking engagements!). I learned quickly that if you’re not visible on social media outlets, you might as well be invisible! Since one of the demographics my company caters to a young adult crowd, I knew that dominating the online space would be a critical element to our success. Since we have a fun and flirty sort of business, it lends itself especially well to the online banter prevalent in Facebook and Twitter. As a small business owner, the danger for me (and challenge) is not to lose focus of all the other marketing activities I need to be engaged in by getting bogged down in social media, which can take a lot of time without producing the “overnight success” many business owners dream of. I have found that by asking provocative questions, commenting on articles and studies, and posting polls and surveys about dating etiquette and beliefs, I can really engage my followers, and spark lively debates on our blog – which gets people commenting and helps spread the word. Popular recent topics include honesty in creating online dating profiles, turning a first date into a second date, whether luck is a factor in finding love, and when to meet someone in person that you met online. Everyone knows someone (or IS that someone) who is a truly amazing person but is just so busy and buried at work that they don’t seem to ever find the time to date. Through our social media presence, and through video promotions using sites like YouTube, we can say to those “I’m Too Busy” people that when they are ready to date, we’re here to help AND we’ll even do the searching for you. If you can put in a couple of hours, our services will do the rest of the work to get you matched up with compatible partners. We use regular promotions on all our social media outlets to attract a following and generate continued buzz. Right now we have “Meet Your Match Online Mondays” where we offer a new promotion every Monday. We’ll also be incorporating MYMO Monday Night Social Events (saving the sacred Friday and Saturday nights for dates! ), bringing our different client demographics in on separate nights to mix, mingle, and learn about a topic of interest to them, such as online dating safety tips, how to get a first date (and turn it into a second), or how to date after a divorce, or as a newly single parent. Social media will be critically important to getting word out about these events AND to finding out what our clients and potential future clients want to hear about. We’ll Tweet and share pictures, find a central meeting location for those who want to attend, and get buzz going on Facebook too. I will also use social media to promote my book, How To Meet Your Match Online, which will cover topics like online dating safety, determining exactly who you want to meet, creating the perfect online profile, and proper first date etiquette in a world where chivalry is on life support. How important do you think social media is for a company? Social media is important, but it is just one tool of many in the small business owner’s toolbox. My goal over the next month will be to figure out how to harness its usefulness while not letting it use up too much time. I need to remember to stay focused on the primary goal of helping singles find love through online dating! I would recommend that other small business owners hire a marketing consultant – like The River Rock Group – to help them stay on track and not lose focus of their larger goals in making their businesses successful. Although being too accessible can be a curse, for a start-up, we see it as a blessing (and hope we can get to the point where it’s a curse – I’m only kind of kidding…). While date coaching is one of the services we offer ($45/month), we will also do a certain amount of this service for free for our Twitter followers. If our followers pose dating questions to us, we will answer them directly or, if we get the question enough, we’ll even do a post about it for our blog. This week we are talking with RESTORE Clothing. Not just “Green” but Responsibly Green! New York City garment industry veterans, Anthony and Celeste Lilore, launched RESTORE® CLOTHING to share their vision of social responsibility and their commitment to producing timeless, well constructed, essential garment collections. You can follow them on their Twitter, YouTube, and Facebook accounts. They also have photos and videos on their website. They also have a blog you should check out! We jumped into social media and networking in July of 2009. At first it was mostly listening and reading, much like getting into a game of jump rope, you have to feel how it goes before getting in the game. Then we started following the folks we admired across multiple disciplines and amplified their voices as well as those in our own community. We are now very fortunate to have many people we admire doing the same for us. After 22 months of studying the social landscape and decades of community building we are baby steps away from launching a completely integrated campaign with goals to “crush”. This plan does include specials (holidays and seasons) and a large push for an interactive community; meaning, we aim to have our followers interact with us, sharing their own stories and experiences as relating to our product and services. Yes, and it is evolving as we do. We set weekly and monthly goals pertaining to growth and outreach. This being said, it is not about numbers, it is about growing a community that shares common values and interests, creating this kind of relationship makes a reliable source of information as well as products. Do you have social media goals for your business? Yes we do. There are expectations as far as putting material out on a daily, weekly and monthly basis. We are also dedicated to responding to and staying connected to those who reach out to us, at least as much as time allows. We all are active in the social landscape to various degrees. A couple of people spend more of their time focused on these goals and day-to-day updates. At this point in time, if you desire to reach a mass audience, you must participate. Even on a local level, you have instant access to an engaged audience. There simply is not another space where access to consumers is so directly available. We connect in real time (as much as sanely possible) and love living out loud. We encourage interactivity and welcome opportunities to engage our followers directly. We do not fear being too accessible. 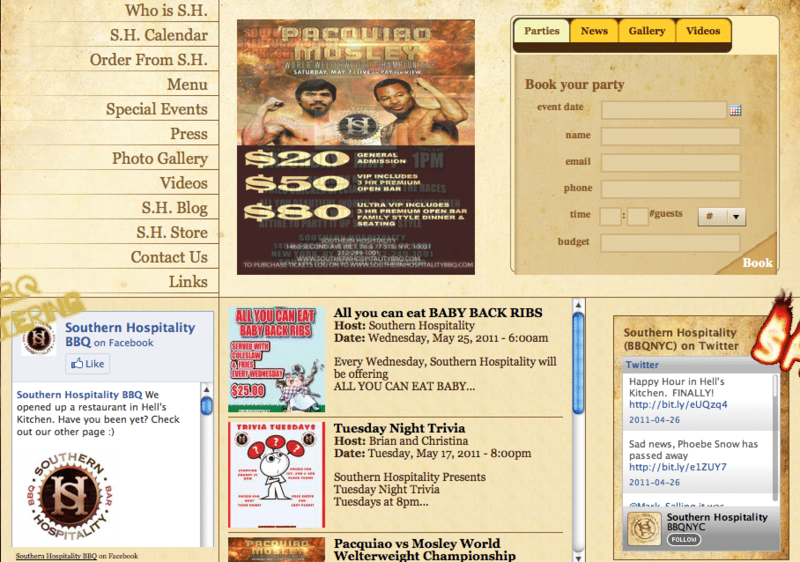 This week we are talking with Southern Hospitality BBQ. With two locations in NYC, you’ll find everyone from Hollywood stars to locals, a menu of fine pulled pork sandwiches, baby back ribs, BBQ chicken, Southern fried catfish and many other southern favorites. You can follow them on Twitter and Facebook accounts. They also have photos and videos on their website. We began promoting the accounts in the restaurants. We offered free food or drinks for likes/follows. We also handed out business cards to customers and offered them discounts if they followed/liked us. In addition to that, we reached out to fans of BBQ, Beer, and Bourbon. We have two locations, so it varies depending on which location. We like to run sports themed trivia for our Upper East Side location. Sometimes we will run spontaneous contest. For instance, on Earth Day we tweeted a few articles about ED and a follower asked if we had a promotion if you wore green. In response, we created a special if you wore green or had something green on you (including money). It was a fun, quirky way to show the community that we are listening. We reach out to our community and offer them free appetizers, drinks, tickets to shows, gym memberships and much more. We also have foursquare and Facebook Deals specials. Currently, we are working on partnerships with a few NYC based tech startups. Our social media plan is always evolving. Our short term plan is to increase engagement and incubate our community. Long term, we want to humanize our restaurants and make everybody feel like they are at home when they are at Southern Hospitality. We would like you to know your waiters and bartenders by their first name. We are also beginning to create partnerships with everybody from celebrities to small tech startups. We even had Charlie Sheen tweet about us last week. We are looking to expand our digital footprint. We are partnering with startups, bloggers, foodies, everyone we can. We would like to grow our online community, not only in size, but engagement as well. Size can be impressive, but we really want to engage with our customers, we want to find out how we can make ourselves better and what we can do to give our customers the best possible experience. It is a mix. We have an employee dedicated to digital, but we love getting input from our managers, bartenders, waiters, everybody. They are the ones in the trenches every day, they know our customers best. I believe it is very important. You now have the ability to get to know all of your customers. I try to make everybody who comes into our restaurants feel like they are a regular, wether it is their first time or their tenth time. Wether it is buying them a drink or reserving them a table, it’s that extra touch that makes people feel special, and now it is easier than ever. We also get feedback right away; we know if people had a great experience or a poor one, and we can act on it almost instantly. We are 100% accessible. I ask every person who tweets that they are coming in to tell me how their experience was. I don’t care if it was good, bad, or ugly. I want to know the people who enjoyed themselves, but even more so I want to know when things don’t go right. I want to rectify the situation right away. We can’t be perfect, so getting all the feedback we can helps us improve our service. This week we are talking with Deschutes Brewery, a brew pub founded in 1988 in downtown Bend, Oregon. They are very prominent in social media with over 15k followers on their Twitter and Facebook accounts. 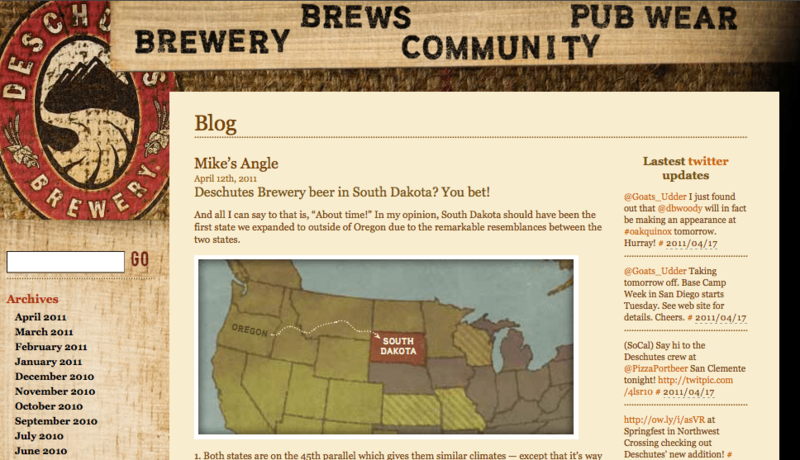 They’re also active on Flickr and have put together a Deschutes Brewery film that ties local landmarks to their beers. We started a Facebook account in Mar. 2009 and Twitter in June 2008. I would say, we post engaging information, facts, photos, and events that beer people want to see. We also have over 300 employees of which most follow us and get their friends to follow us too. We also have 2 pubs with information about how to follow us as well as an icon on our website and our e-newsletter. We have not run any contests but when we ask for suggestions and get some great ones, we’ll send off some swag as a thank you for the idea! EX: I was cooking dinner one night and asked fans to send me their recipes that use beer. I chose one that suggested Beer Cheese Soup and I made it. It was awesome so I send off a t-shirt for the idea. Not written but we only have 2-3 administrators that can make posts on facebook & twitter and we’ve been to trainings about what to and what to not post. Our goals are primarily about interactions, not how many people follow or “like” us. We could have 1,000,000 followers but if there is no interaction…what’s the point? Some goals we’ve set for 2011 are 100 fan interactions per week on facebook, 50 retweets per week on twitter, 1-2 video posts per week, photos from around the brewery, and all upcoming events get posted as well. We have 2 full time people dedicated to social media (Digital Marketing Director and Social Media Coordinator). We also have 1 staff at each pub that update beer, menu and pub happenings. VERY, VERY, Mega Important! If there were no fans, there would be no Deschutes Brewery. We love keeping up with what people are saying about us and about other craft beer in the US and the world. Our fans are our “brand ambassadors”. Word of mouth spreads more quickly than any visual ads so when people have great things to say about us via social media, it quickly spreads and that’s the idea! Our team has 2 different schedules: I work Sunday-Thurs and Jason Randles (Digital Marketing Manager) works Mon-Fri and we both check in on Saturdays or schedule tweets to go out on that day so every day of the week is covered via social media. If there is a question, comment, or complaint, we answer it right away. It may be as easy as a quick comment on twitter or facebook but if seems like a larger issue, I give out my e-mail address and ask them to tell me about their experience via e-mail & they always do. Then we figure out how we can help and defuse the situation right away so it doesn’t spread any further into cyberspace. Usually we make fans for life that way. I also answer all of the “contact us” e-mails that come in through our website (50-100 per week) and I get to everyone w/in 48 hours as long as I am not on vacation. If there is an issue, I again handle it right away and if a refund is required, I get that out right away with a hand written note and fans love it. We both love what we do so fear of being too accessible is not an issue right now but we do plan on expanding our distribution further east into the US (we are only distributing to 17 US states and BC now) so it may become an issue later on but maybe the staff in this department will grow with our distribution growth as well. We’re starting a new series on the BlogWorld Blog called Small Business Social Media Profiles. I’ll be talking with small businesses who’ve incorporated social media aspects into their website, marketing, and promotion – asking them for their input and hopefully encouraging you to further your social media reach! First up is The Mermaid Inn in NYC – a casuallly sophisticated urban fish shack located in the East Village and Upper West Side in New York City as well as the Mermaid Oyster Bar located in Greenwich Village. Very prominently on their homepage they have links to their Twitter, Facebook, and Tumblr accounts – plus a link to their Oysterpedia app! I think their website layout and flash elements are very fresh and sophisticated. I was excited to talk to them further! We started our twitter and facebook outreach about two years ago. At first we reached out a lot to people in the food community – food bloggers, oyster lovers etc and they helped get the word out about the account. Also we made sure everyone on staff was aware of what we were doing and supported/promoted it in the restaurant as well. We have Social Media Mondays in which we tweet a password or phrase as well as put it on our facebook page for a 20% discount if a customer says this phrase to their bartender or server. We also have the best foursquare deal in the city – check in for a free side for your table or steal the mayorship for a free lobster sandwich (a $26 entrée!). We also have an iPhone and Android app called Oysterpedia that is a guide to over 200 North American oyster varieties, with tasting notes, photos, and rating system to save your favorites. 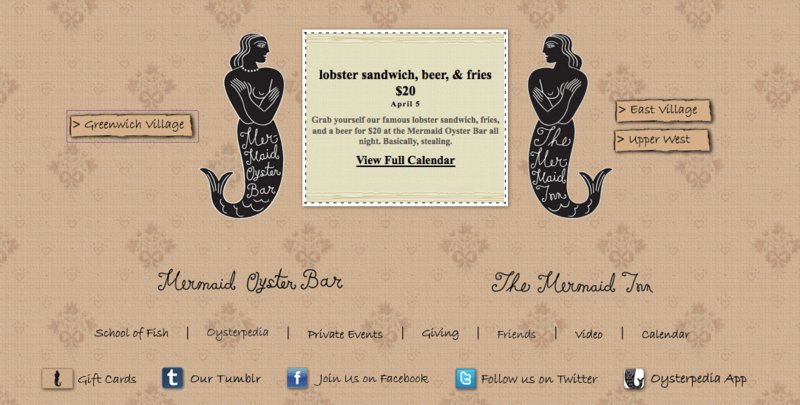 Our social media policy is to connect and communicate with our customers – both current customers and potential – and to do that in an engaging, fun way that promotes the Mermaid brand as a quality, laid-back neighborhood seafood restaurant. Our social media goals involve increasing our social media presence and quality of interactions, sharing (and learning) about topics relative to us – such as oysters, etc., staying on top of what is going on in the social media world, and finding new ways to promote our brand as well as listen to our customers. Many of our employees are on social media and post their own things about the restaurants but we have one dedicated person who is the voice of the Mermaid and her personality through our official social media accounts. I think social media is important for companies because it’s a great way to interact with customers as well as get new customers, and hear feedback about your company and the things you’re doing. For a restaurant it’s a great way to share information about what is going on – such as new menu items and special events – and having other people (your followers) promote it too. We deal with questions/concerns/complaints on social media the same way we would if we heard the complaint at the restaurant. We respond in a timely manner and if there is anything that needs to be resolved, we resolve it as well as answer any question asked to us. I don’t fear we are being too accessible. We’re a laid-back, fun and casual restaurant environment and we’re not too stuffy to hear what our customers have to say. It’s fun and it gets people excited about the restaurant.